Leaves: Alternate, palmately 3-foliolate; stalks 1/25 to 3/4 inch long; leaflets linear or linear-elliptic, .2 to 1.6 inches long, 1/50 to 1/6 inch wide, fleshy, sticky-hairy; tip with short, abrupt point. 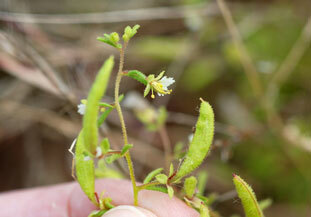 Inflorescences: Raceme, short, few-flowered, terminal; bracts 3-foliolate. Flowers: Sepals 4, 1/16 to 1/8 inch long; petals 4, fan-shaped, clawed, white to yellowish-white, of two types; larger pair 1/6 to 1/5 inch long, tips shallowly lobed in 3-5 segments; smaller pair 1/12 to 1/8 inch long, more deeply notched; stamens mostly 6-9; filaments 1/8 to 1/5 inch long; gland prominent between corolla and stamens, yellowish, drying purplish. Fruits: Capsule, borne on narrow stalk, ascending, linear-cylindric, .6 to 1.2 inch long, 1/8 to 1/6 inch wide, slightly inflated, glandular-hairy; seeds 4-18, tiny, round. Habitat: Prairies and plains, along streams and rivers, blowout areas; sandy or gravelly soils or in pure sand. Comments: Cristatella can have a rank odor. The name jamesii is for Edwin James (1797-1861) a botanist geologist, and military surgeon. Photos are of a plant observed flowering in late September.